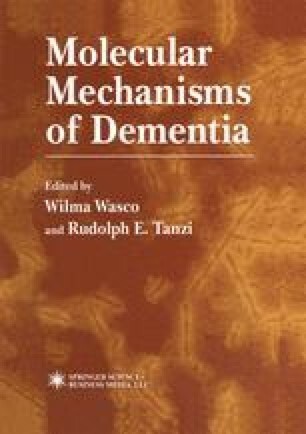 Alzheimer’s disease is characterized clinically by a progressive loss of memory and other cognitive functions, resulting in a profound dementia. The intellectual decline is accompanied by the progressive accumulation in the brain of insoluble fibrous material, extracellularly in the form of senile plaques, and intracellularly in the form of neurofibrillary lesions. Alzheimer’s disease is genetically heterogenous, with different primary causes leading to the same phenotype and neuropathology. It is therefore possible that the activation of several distinct pathological pathways can lead to the disease, with neuritic plaques and neurofibrillary lesions representing the points of convergence of these events. It follows that a study of the mechanisms that lead to the formation of plaques and neurofibrillary lesions is essential for an understanding of the pathogenesis of all forms of Alzheimer’s disease. The formation of neurofibrillary lesions is believed to lead to the symptoms of the disease, which result most probably from the degeneration of nerve cells in cerebral cortex and hippocampal formation, with ensuing neuronal cell loss and reduction in synapse numbers.